Happy October from Hutchins Farm! Two announcements from us today, one: Bulk Order Sign-Ups begin today! And two: Our closing day of the farmstand this season will be Wednesday October 31st. BULK ORDER SIGN-UPS: In contrast to last season, when we had so many carrots that we didn’t have people sign up for 25lb bags, just had plenty on hand, this year we have so few carrots that we won’t have any 25 lb bags of carrots available. 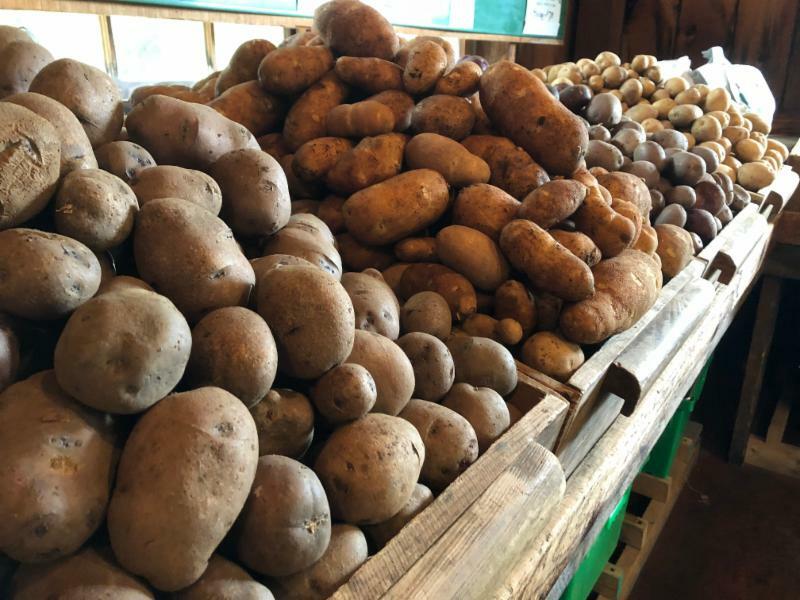 We ARE able to offer our usual 50 lb bags of potatoes, with three varieties available: ‘Kennebec’, with white skin and flesh, versatile in the kitchen, and excellent storage characteristics; ‘Keuka Gold’, a nice newer variety developed by Cornell with good storage potential, light yellow flesh, and excellent culinary characteristics; and ‘Carola’, our old favorite with bright yellow, moist flesh and distinctive flavor. e-mail-send your order to info@hutchinsfarm.com. Please let us know how many 50 lb bags and of which variety (from those listed above) and any backup variety choices you would be willing to accept if we are out of your first choice. All varieties are limited in quantity-we will fill orders on a first come/first serve basis. In case of shortages, we HIGHLY encourage you to provide a second choice variety when you sign up or you will risk not getting any at all. Bags will be available to pick up beginning Tuesday, October 23rd, through closing on Wednesday the 31st. If you’re unable to pick up during that period, please contact us to set up a pick up date after we close. The arrival of late autumn is in many ways a relief after a season more full of challenges, setbacks and failures than most. As an organic farmer with many seasons behind me, I am no stranger to the disappointment of crop failure, the frustration of missed opportunities, the dismay of watching the slow-motion train wreck of a row or a bed or an entire field failing to thrive, overrun by weeds, or insects, or disease. Over the course of the last half a decade or more, we have been fortunate enough to have kept these unwelcome events to a minimum, so that maybe we have a short crop or two (or three) during a season, but the abundance and variety of everything else made up for it. There have been seasons where spinach was hardly to be found in the fall, seasons where carrot germination was spotty and yields were low, seasons where late summer heat led to a shortage of lettuce in September and October, seasons where the parsnips failed to germinate enough to even have a crop at all, seasons where entire broccoli plantings were overrun by disease, seasons where the apple crop was non-existent. These are generally isolated events, sad outliers in a general trend of success and abundance, but circumstances have conspired this year so that this litany of unwelcome episodes, each heartbreaking on its own account, have occurred all at once. Which is not to say that we haven’t had our triumphs-our eggs are in way too many baskets for all of them to break. Strawberries were early, delicious and abundant. Lettuce was, for a long while, unfailingly abundant. Summer squash and cucumbers had a long, bounteous run. Cool spring weather didn’t slow down our corn, tomatoes or melons which were all harvested at an earlier date than ever. Tomatoes in particular were early, prolific and delicious-tomato yields for the season are at an all-time high. And some of our fall crops performed very well, including a large and beautiful crop of winter squash, pumpkins, potatoes and sweet potatoes. Despite our somewhat abridged fall offerings, we still have a creditable spread of fresh, delicious seasonal vegetables filling our farmstand and markets. If you’re able to visit us before we close the farmstand for the season on Wednesday, October 31, you may find kale, collards, arugula, radishes, winter squash, potatoes, sweet potatoes, celery, celeriac, carrots, parsley, cilantro, dill, turnips, scallions, popcorn, leeks, lettuce, Chinese cabbage, endive, escarole, hot peppers, eggplant, cauliflower, and many more options. We expect to see more beets, spinach and broccoli by then as well.